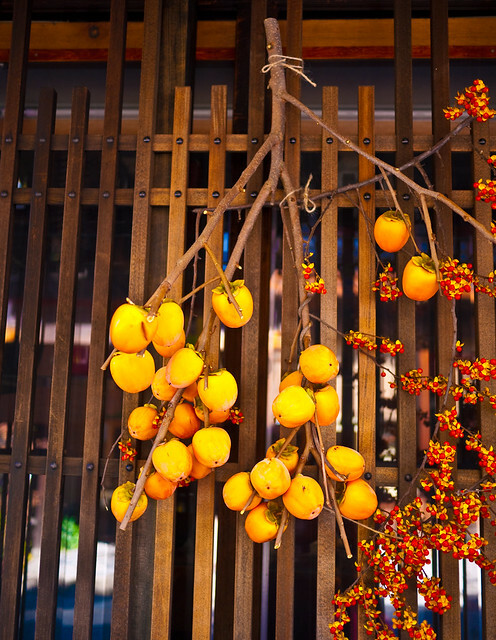 To me, persimmons or kaki (柿）are the quintessential fall fruit. 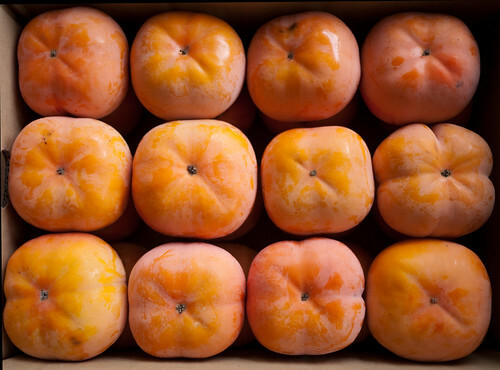 Although there are by some counts around 1,000 different varieties of persimmons in Japan alone, they can be broadly divided into two types: sweet (amagaki) and bitter or astringent (shibugaki). The ones in the photo above are the sweet kind, which can be eaten as is as soon as they are ripe. They have firm flesh, and are simply sliced. The photo below shows a branch laden with the bitter type (shibugaki) hanging outside a house in Naraijuku, a small historic town in Nagano, Japan. These are just decorative, I think, but bitter persimmons are usually hung outside until the bitter substance slowly drips out and the fruit dries out. The resulting dried persimmons (hoshigaki) are as sweet as candy, and the bitter liquid itself is used to lacquer wooden wares in the area. 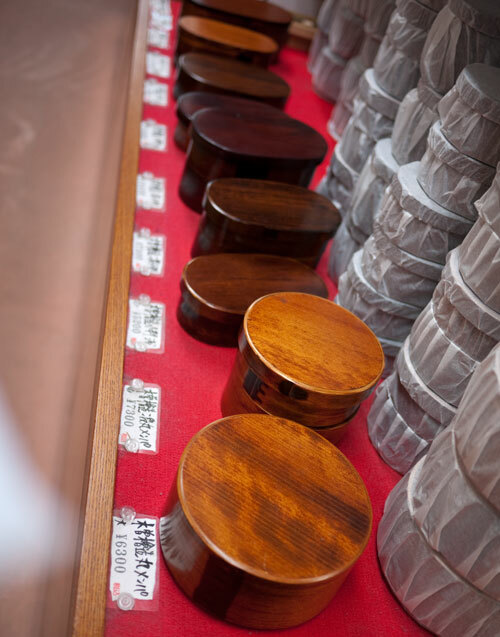 Here are some lacquered bento boxes for sale at a local shop; the dark ones in the back are lacquered with persimmon bitter (kakishibu). Submitted by maki on 2011-11-28 18:42. I agree about persimmons being the quintessential Fall fruit. Recently picked up some Fuyu persimmons at a Korean market near Washington, D.C. Some of them became mushy-ripe before the others, so I made persimmon puddings with the over-ripe ones, topped with slices of the fresher ones. I love everything about them, from the four perfect dull-green bracts to the dusty bloom to the luminescent orange color underneath. They're also quite tasty. I think it depends on the variety. Some persimmons have rather thick, inedible skins that need to be peeled, while others have very thin skins. Also personal preference I think! Persimmons are a quintessential fall fruit -- my grandmother's tree is positively groaning with it (and so is her neighbor's; my grandparents planted a tree there when they owned the house decades ago and their neighbor has no idea what do to with the fruit! I'm thinking of leaving a flier for local food pantry gleaners to come by and take the fruit before it rots. Anyway...). My Filipino grandma has tried many different routes of eating through the fruit, from giving it away to friends and family to trying it in several recipes or just drying them in her dehydrator. My favorite way to eat it is in her persimmon pie (like apple, only with persimmons instead) or just plain slices, while my husband likes to munch on the dried fruit all winter long. i had no idea you could lacquer wood with persimmon! i usually keep the bitter kind on the counter or in a bowl until they sweeten up. but i don't see any bitter stuff coming out ... where does it go? When they are hung out to try, the bitter stuff drips out of the end, and that's collected to use later. It takes a ton of drying persimmons to gather a decent amount though! I just discovered kaki a few weeks ago. Never even heard about them up until then. Somewhat like them now, they are a nice sweetener in a simple fruit salad. Do you have any other ideas of what I could use them for? I arrived in Japan as a new English teacher in the month of November (back in 1991). My first outing was that weekend - a fall hike in the mountains of Wakayama prefecture. We hiked up to a farm that harvested persimmons (shibugaki) and dried them (hoshigaki) for the new years celebrations. We got to enjoy watching the process and then savoring the finished product. It is still one of my favorite memories in Japan. We ended the day with a Japanese BBQ of okonomiyaki and yakisoba. And just today at lunch I enjoyed a "kaki" and thought of this memory. Thanks for sharing your photos and helping me enjoy my "natsukashii" moment today. I'm so embarrassed to say I've never eaten or cooked with a persimmon! Since it is a quintessential fall fruit I think I need to get on the bandwagon! Thanks! My MIL is from the Phillipines and she has made meals with persimmons. Usually a desert but once she used it in a cider. The sweet kind of course. It was pretty tasty. I love persimmons! I had never had the sweet fuyu variety (like the top photo) until I reached adulthood. Growing up my mother would always buy the "astringent" hachiyas; we would wait until they were completely ripe and soft all over, simply cut and half and scoop with a spoon. That way they were even sweeter than the fuyus but you have to make sure that they are completely soft otherwise you'll end up with a scrunched face. I had never tried persimmons before but Meijers had them on sale in the "use now" produce section for .40 cents-- for SEVEN of them. So I got to try some sweet persimmons! Very tasty indeed, and even though the outsides were a little damaged, they have all been great and easy to eat! I'm glad I tried them. Today I also shared some with my Mom and she liked them too. She'd only eaten a sour one before and hadn't liked that one much. As a secondary note, on the same day our local produce person staff must be insane because he/she also put out avocados in that same sale section (use now/at once) with 12 a bag for only $1.00 per bag. My sister purchased five bags. We have over 60 avocados to turn into guacamole and eat. It's been amazing! I liken it as if we had had an avocado tree that suddenly came ripe all at once--in KY, i n the middle of December. Only about five of these avocados were bad enough to throw away. . . Produce person, we LOVE you. こんにちわ、まきさん！Well, I am back from visiting my parents in Japan. I had to comment again, because while I was in Japan, I ate a Kaki (柿) everyday because my aunt sent Mom a huge box of Kaki. I like it really soft and gooey! The only thing about Kaki is that it has a very unpleasant side effect (a.k.a. constipation!). Is it only me and my mom that have this problem? Kaki I find in the US (at least in this area) are not as good, many of them very bitter. I am tempted to make Hoshigaki (干し柿）which I love, love, love. Hope you are feeling better day by day!! Have you been eating the whole persimmon (excluding the green tops)? The bitter white core causes constipation and should not be consumed. I usually just cut it out and throw it away. I, too discovered persimmons just this year. There are several trees growing around my neighborhood, though they're the native Georgia variety -- small and bitter, unless you let them get really mushy. Still tasty, though. My family has a persimmon tree in our yard. We eat them fresh when ever the tree is producing. We also eat the dried ones. I didn't realize these were bitter before they were dried. They are super sweet. This process sounds kind of like removing the bitter taste from acorns. We also eat acorns and have to soak them in water many times before they are eatable.